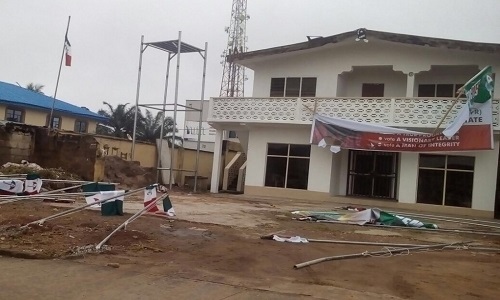 The Ali-modu Sheriff-led faction of the Peoples Democratic Party (PDP) in Ondo State, on Sunday, said hoodlums suspected to be members of the Ahmed Markarfi-led faction of the party invaded, attacked and destroyed the campaign office of its candidate, Mr Jimoh Ibrahim. Speaking on the attack, the Director of Publicity of Jimoh Ibrahim Campaign, Sola Akinuli, said the suspected hoodlums invaded the party’s secretariat along Oyemekun Road, Akure, on Saturday night. Akinuli, who condemned the attack, described it as unfortunate, saying the hoodlums destroyed the party’s flag and the country’s flag at the secretariat. of hope to the people of the state was also pulled off the wall of the building. Akintomide described the act as barbaric, destructive and a very dangerous way of playing politics. However, the coordinator of Eyitayo Volunteer Group, Olumide Ogunkua, who also condemned the attack, described the allegation against Eyitayo Jegede campaign group as false and figment of the faction’s imagination. He said all the campaign vehicles of the Eyitayo Campaign group were neatly packed at the campaign headquarters on Saturday while his principal was busy soliciting and canvassing for votes from the people of the state towards the November governorship election.